The Copenhagen round-up! - Well Dressed Dad - It is a proper menswear blog. Like, with original words and opinions and suchlike. A two day trip to Copenhagen on business provided me with the opportunity to look up a few of the places I’ve had on my Short List of Interesting Things to See in Copenhagen (and no, there is no clever acronym hiding in there, though thank you for noticing there might be). 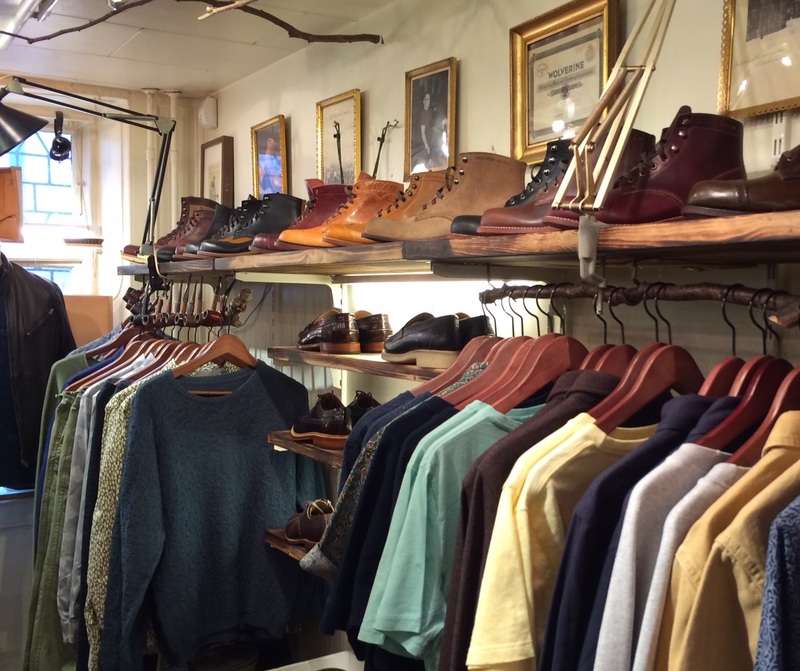 I’ve posted separately about my visits to Hansen Garments and Maritime & Antiques, so this is the definite and essential roundup to the rest of the places you might want to take a look at if you happen to find yourself on the ground in Copenhagen. 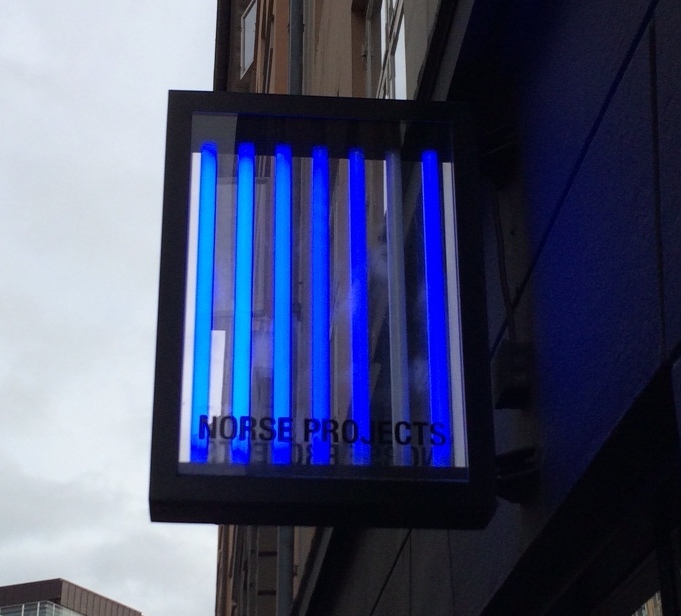 The first shop I found, whilst wandering around looking for the markers placed on my Google map, was the Norse Store, or Norse Projects as the sign says. I’ve often wondered whether the two were related, and I think I can lay this conundrum to rest now. I’m not sure why they operate with two different names online store and the store in the world of concrete and glass, but there must be some twisted logic to it. In any case, I found it and it’s a decent little shop. And although named Norse Projects, it actually has all the various brands from the online Norse Store. This means that in addition to their own output they carry brands such as …. heck, the list is long, have a peek here instead. 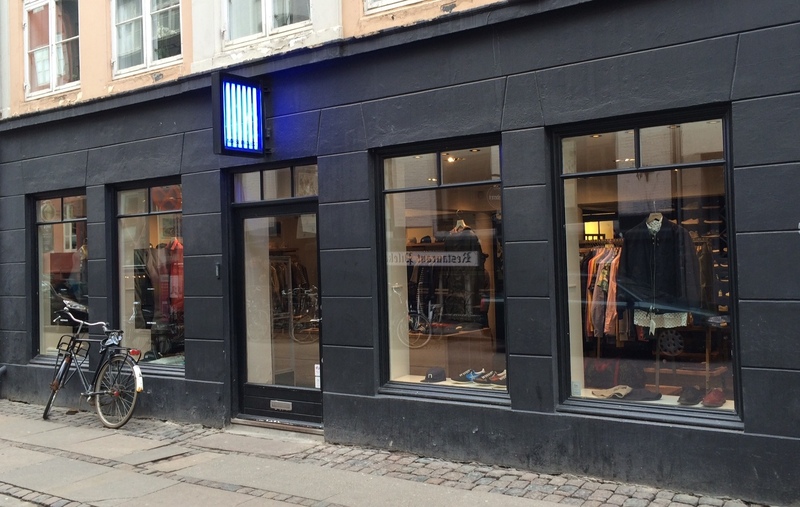 Norse Store from the outside! I had a quick browse through the store, fondled some shoes and felt up a few shirts and bade my farewells. 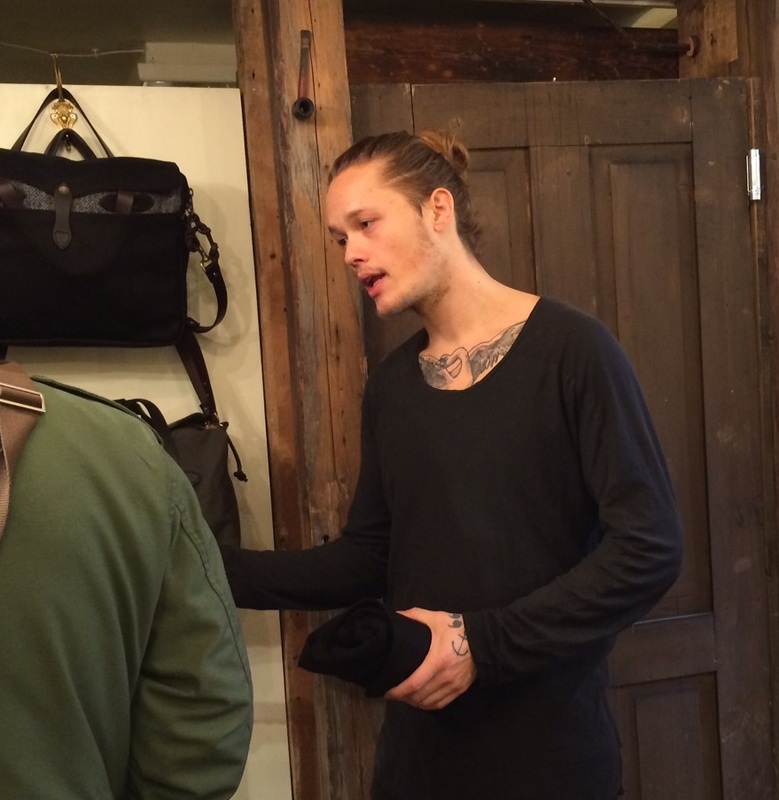 A mecca for those enamoured by the New Scandinavian look, but a little samey to my eyes. Too much similar stuff really, and while the designs tend to be clean and unfussy, they are also clean and not much to distinguish them. Credit for having a lot of brand included, which does add interest. Norse alone would have made struggled to fill the shop. Which sort of provides a segue into the next shop I stopped by. Next up I happened across han Kjøbenhavn. A bit of an up and coming brand, starting out making spectacles and now moving into clothing. 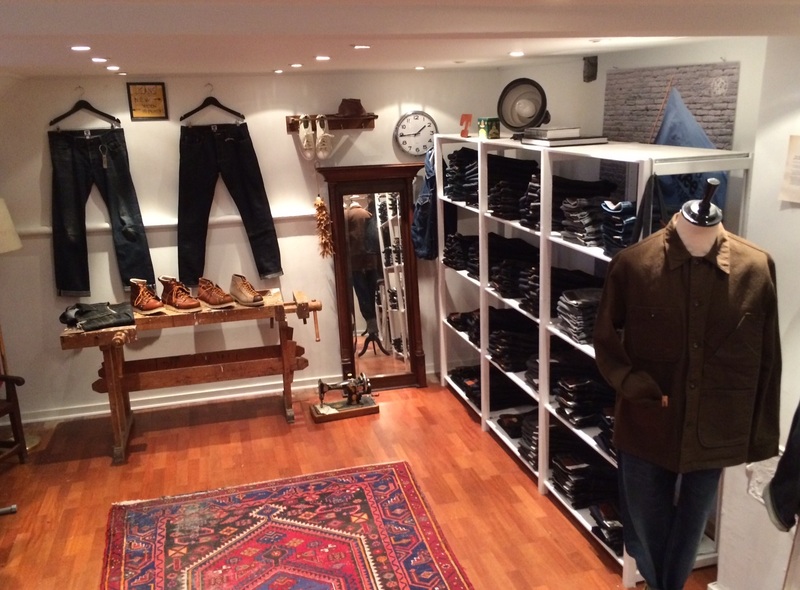 Another very clean shop layout, furnished with taste and a good eye. The first thing to catch my eye was a wall of Lego Architecture, very cool indeed! Secondly, I noticed their collaboration with Pendleton. Wool shirts and trousers, in fetching blue and light grey, very thick and lovely wool. Speaking to the chap in the store, it was obviously a genuinely Big Deal to collaborate with Pendleton like this. 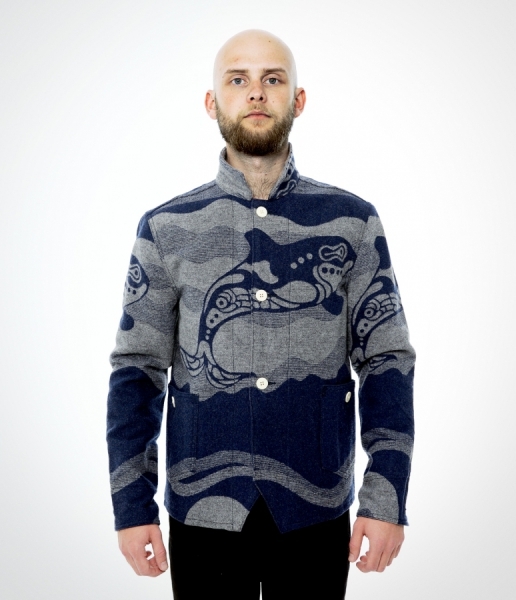 The design though is pretty awful, and even though I’ve heard the Sea Wolf story behind it, I can’t imagine anyone actually wanting to wear the wool jacket and trousers with the large whale design. It would work well for home use. Interestingly they use a model for many of the huge in store posters that must be on the far side of 50, a rather pugilistic looking older gent. Certainly no spring chicken, and his menacing look is very much a statement of intent. Definitely advertising that makes me pay attention, and probably very many others as well. 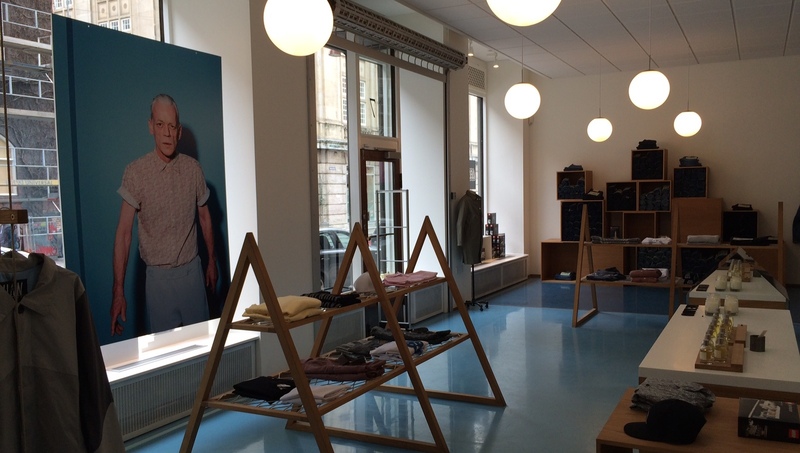 Han Kjøbenhavn is still a small brand when it comes to clothes, and their shop appears to be only their own production, and Lego, so it is a good example of the sparse Scandinavian style. Which sort of translates to “not all that much to look at”, and while the chap working there was friendly and talkative, I had soon exhausted the tactile and visual opportunities available and found it time to move on. 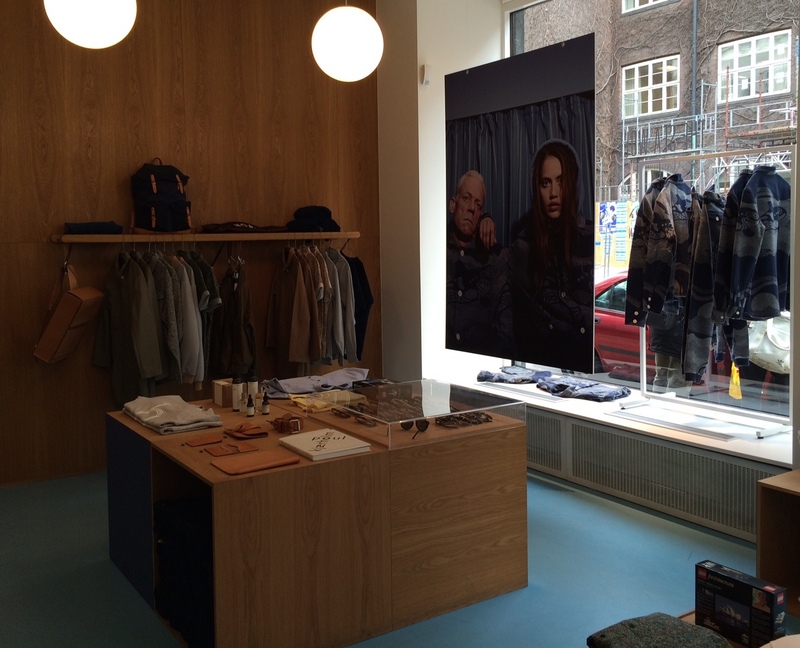 Next up I visited A Small Jeans Company, Copenhagens quite newly started variant of the Proper Denim Store. The shop itself presents itself very well. Compact, yet spacious, over two floors, you sense there has been effort put into creating an interesting and attractive shop. Looking around though, I can’t help feel that the selection of brands presented lacks a little ambition. None of the trendy Japanese denim, only Tellason of the American brands. German Pike Brothers is a nice inclusion, as they do some nice stuff. Also good to see support for local the Wrenchmonkeys brand, and Swedish Pace jeans. At the same time though, there is space allocated to brands such as Gant Rugger, which to my mind has no place in a shop such as this. In summary, if more effort is put into the selection, this could be a good shop, but at the moment it falls a little short. 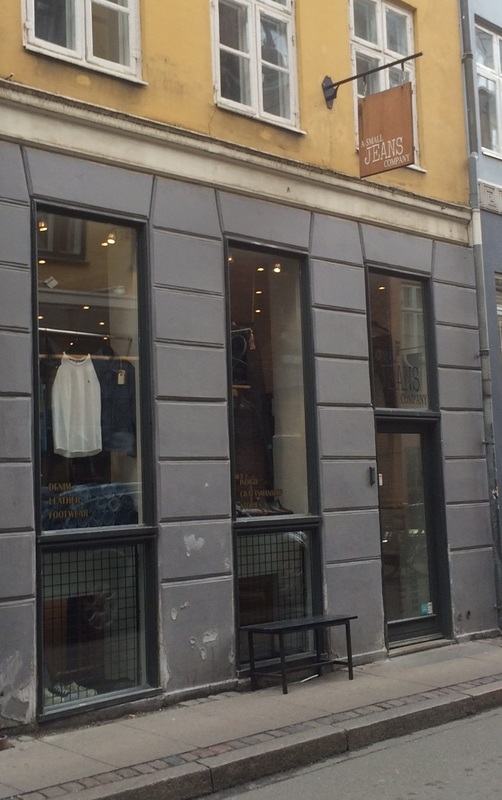 A shame, as Copenhagen deserves a decent denim shop! And onwards my foot tour of the city goes, this time to a shop that has made a great impression on me through their online presence. 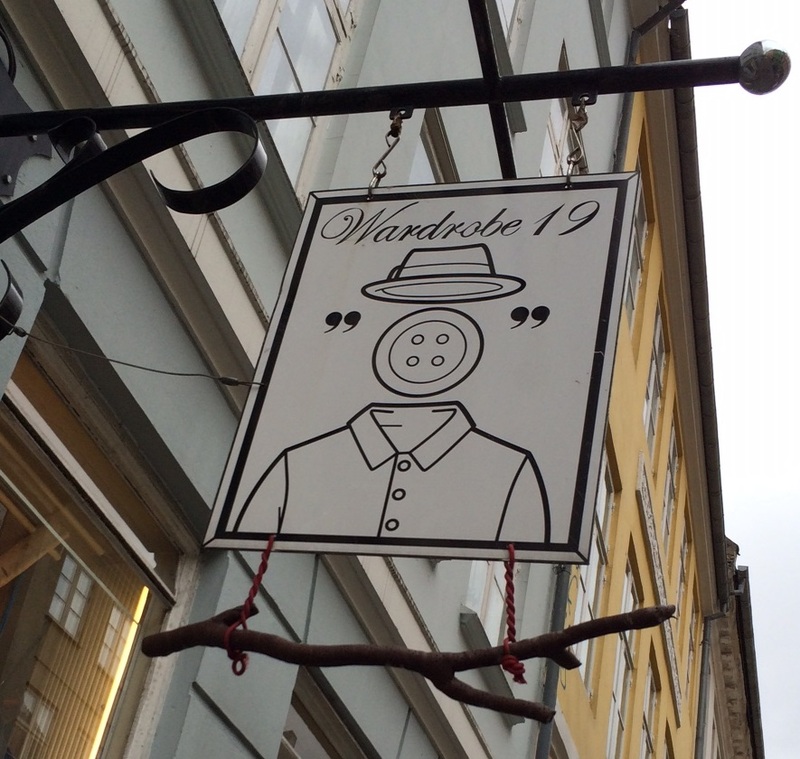 I included Wardrobe 19 in my guide to online shops of distinction a while back, and was very curious to see how their real world shop would compare to their innovative and well done online presence. The first thing that strikes me is that the quirkiness of their website stems from the design of their real shop, and has a solid grounding in a combination of a sense of humour and an eye for details. None of the po-faced minimalistic and sensible Scandinavian interior design here, here it’s very much more fun. Noticing the details is a delightful exercise and makes a wonderful change. The shoe shelves made of old books is one example. 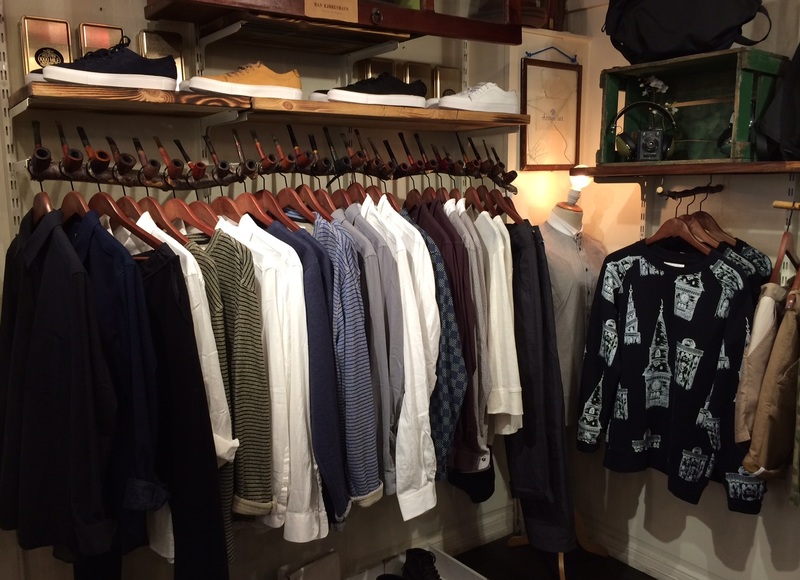 The websites signature pipes are found several places, noticeable on the racks where the selection of shirts is hung. It’s not a huge shop, but the selection of brands is strong, with local brand Hansen and Han Kjøbenhavn well represented. Else wise a fine mix of the Scandinavian, the British and the American, with a good selection of items from each brand. I was so close to grabbing the Filson and Harris Tweed bag shown underneath, but sense prevailed. Anyone that has visited their website will have noticed the effort and skill that has gone into their presentations. Some may also have wondered who their model is. Through the application of some truly high-level sleuthing I can reveal that a lot of the modelling is done by Martin, as in the photo above. Once you pay attention to his tattoos it’s not that difficult. Definitely a shop worth visiting! You look right about that denim shop. Gant Rugger indeed. Whomever gets the contract to sell Edwin, LVC & LEE 101 over there is going to make a bleedin’ fortune. I’m really surprised there’s not a place selling The Flat Head, Iron Heart, Momotaro and so on. I’d agree with you on Norse Projects too. It knocks out gear of decent quality – I have a couple of their shirts – but it is very pedestrian. Like WoodWood, I suggest it will be a brand that will disappear from view in 24 months time. 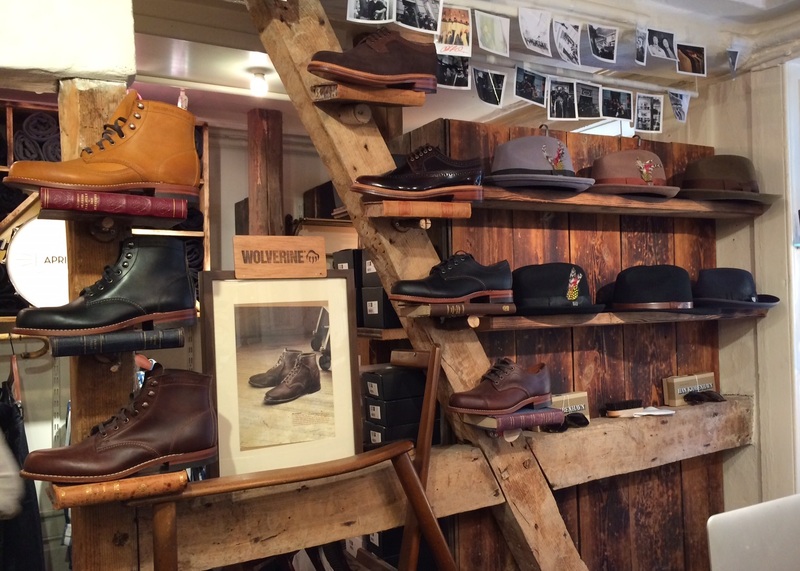 Nice to see the store though – I bought my Yuketen Sports Chukka’s from there online a couple of years ago and they were a great bunch to deal with.